. . .OR. . .The Great Brooklyn Railroad And Land Development Fraud Of 1859 - 1861 . . .
One of the most misunderstood aspects of the history of the Atlantic Avenue Tunnel and the early LIRR in Brooklyn, are the factual reasons for its closure in 1861. The original LIRR destroyed itself in the mid 1840's by first, deviating from their original business plan, and then failing to follow Cornelius Vanderbilt's "master plan". Starting in 1850, the LIRR was taken over by a group of Philadelphia investors, and operated as a local transit line for Atlantic Avenue, and as a conduit for the farmers (and the substantial farm produce) of Long Island. The LIRR wasn't removed from Brooklyn, until a small clique of real estate speculators lead by the Litchfield brothers prevailed circa 1859-1861. To break it down to its simplest terms, the Litchfield brothers simply "went where the money was". During the mid 1840's through the mid 1850's, three of the Litchfield brothers, Electus Backus, Edwin Clark and Elisha Cleveland, owned substantial, if not controlling interests in several Midwest railroads, viz. : the Cleveland & Toledo RR, Toledo & Illinois RR, Belleville & Illinoistown RR, Michigan Southern & Northern Indiana RR, Terre Haute & Alton RR- and last, but not least, the Demoine Navigation & Railroad Company- which wasn't a railroad at all, just an Iowa land scam. Source: US Railroad Directory, 1856 (see pgs 111,123,133,138,140,157). The fourth Litchfield brother, Erasmus Darwin, comes into play during the early 1860's, utilizing his position as a London banker, and as the "Collector" for the Tunnel Closing Special Assessment Tax. The fifth Litchfield brother, Egbert Delos, makes his appearance in future dealings with James J. Hill (in Minnesota), but apparently played no part in the brother's Brooklyn activities. Many of the railroads cited above, together with the New York Central RR and the Hudson River RR, were used to form the "first all rail line" from New York City to Chicago during the mid 1850's. This was well before Commodore Vanderbilt was involved with the New York Central, or the Hudson River RR. However, in the Financial Panic of 1857, the Litchfield brothers "found their interests overextended, and could not hold their control in the reorganizations that followed". This fully explains the total, virtually desperate focus E.B. 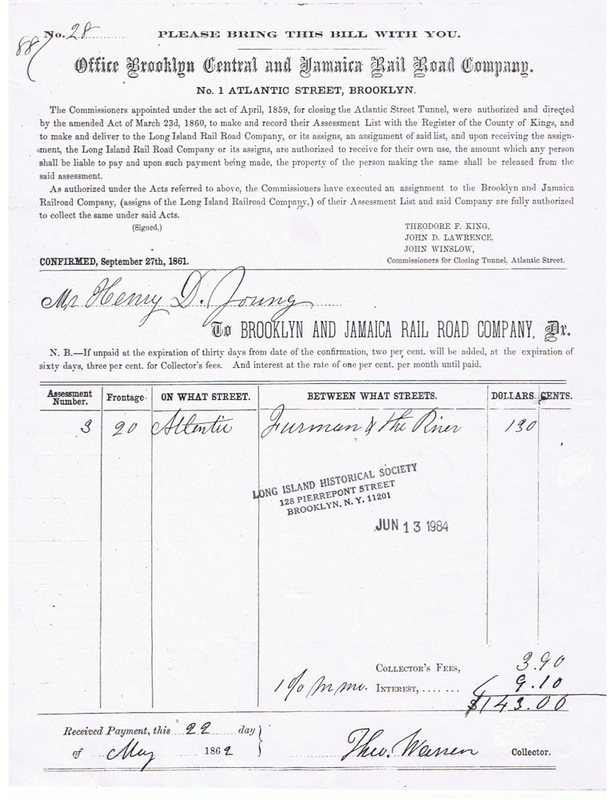 Litchfield and his associates were able to level at Brooklyn's Long Island Railroad in particular, and Atlantic Avenue in general. As far as the Litchfield brothers were concerned, in 1857, Brooklyn became the only game in town...at least until Minnesota came a knocking..." (Source 1: Biographical Dictionary of American Business Leaders, Vol 2, pg 806, by John N. Ingham, 1983. Source 2: Machines and Morality: The 1850's, by Robert Sobel, 1973, pg 66- 67, 235-238. ). A question that begs an answer, is why the opposition to the LIRR was "inconsistent" during the 1850's? The answer is world affairs, relative to the financial activities of the Litchfield brothers. Opposition to the LIRR in Brooklyn first nebulized during the period of 1850- 1853. This period coincided with the Litchfield brothers mainly focusing their attention on Brooklyn real estate speculation, as exemplified by E.B. Litchfield becoming Alderman for the 6th Ward during 1850- 1851, their purchase of the square mile sized Vecht- Cortelyou farm (1852) which was the origin of Park Slope, and E.B. Litchfield's January 1853 applications to the City of Brooklyn, for permission to build and operate a streetcar line connecting the Litchfield's Brooklyn real estate holdings with the Fulton and Montague Street ferries, via Brooklyn Height's Montague Street. With the start of the Crimean War in October 1853, the prices and demand for U.S. grown grain skyrocketed, as the Russian Empire, then known as the "bread basket of Europe [today's Ukraine]" was now at war with the British Empire, French Empire, the Ottoman Empire, the Kingdom of Sardinia, and the Duchy of Nassau. A large portion of the grain grown in the U.S. at the time, came from today's Midwest (Ohio), and other adjacent areas, then partly referred to as the "Pacific Northwest Territories". This translated to an increase in the value of Midwest land usable for agriculture, and also the railroads needed to provide transportation access. Thus, in 1853, the Litchfield brothers refocused their attention away from Brooklyn, to renewed speculation in Midwest land and railroads. The end of the Crimean War in 1856, led to a major drop in demand for U.S. grain, and a subsequent drop in value of Midwest land and railroads, starting a series of events in the U.S. that led to the Panic of 1857- and the return of the attention of the Litchfield brothers to Brooklyn. Other major factors of the value decline in Midwest land speculation and railroads, was the failure of Ohio Life, a bank with a free-wheeling New York office and extensive speculative Midwest railroad and land mortgage holdings, as well as the Dred Scott Decision of March 6- 7, 1857. The specter of slavery spreading through the new Midwestern states, threw a major damper on land speculation in that region, as immigrants would certainly not come to new slave holding territory. In fact, "the difference between western and eastern through passengers entering Chicago from the east, a measure of net immigration, declined from an estimated 108,000 passengers in 1856, to a mere 10,000 in 1860". (Source 1: The Panic of 1857, Calomiris and Schweikart, 1991 Source 2: Fishlow, American Railroads, pg 202- 203). During the 1850's, downtown Brooklyn's newly created Tenth Ward was burgeoning with nascent commercial development. This ward was bounded on the west by Court Street and on the east by Flatbush Avenue- and bisected north and south by the street surface running section of the LIRR. 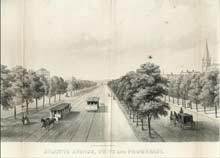 If a rational and honest state of affairs would have prevailed at the time, the Atlantic Ave tunnel would have simply been extended eastward to Flatbush Avenue, thereby making the contentious Brooklyn 10th Ward whole. However, certain interests wanted to politically and economically exploit this situation. Seemingly out of nowhere, came a mysterious rabble rouser known only by the nom- de- plume of "Pro Bono Publico". Virtually singlehandedly, "Pro Bono Publico" organized "public meetings" against the LIRR and the tunnel- but was in hearty support of the newly proposed "Atlantic Avenue Drive & Promenade" project. Note that 19th century "public meetings" commonly entailed the distribution of money, free food and alcohol to the attendees. These "meetings" quickly grew into a political pressure group- the "Tenth Ward Association". The Brooklyn City Common Council members- and State Legislators- from this large and populous ward must have relied heavily on the constituency of "The Tenth Ward Association". Pro Bono Publico & Company had a master plan: remove the LIRR, close the tunnel and build the Atlantic Avenue Drive & Promenade- essentially a sweeping real estate development project. To effect this plan- and create a source of public funding for the private real estate aspect of their project, they pushed through the NYS Legislature in 1859 the "Tunnel Act", Chapter 484 Laws of 1859. This law banished the steam powered LIRR from Brooklyn, closed the tunnel- and created a pot of public money totaling $130,000- a huge sum of money in the late 1850's. This pot of public money was to be generated by a Special Assessment District created under the "Tunnel Act"- but was to be given over to private entities for their own use. The legal mechanism by which the public money was subsequently collected by and retained by private interests under the "Tunnel Act" and a subsequent companion State Act, was later found Constitutional by the NYS Appeals Court in 1869 (Litchfield vs. Vernon). HOWEVER- the same court proceedings (Litchfield vs. Vernon) exposed the fact that the actual execution of the "Tunnel Act" - and thereby the closing of the tunnel, was nothing more than a huge Fraud perpetrated upon the people of Brooklyn. This betrayal of the public trust was perpetrated by then Mayor of Brooklyn Samuel S. Powell. As Bernstein said to Woodward (Watergate) "follow the money trial". As per contemporary Court writings (The People Ex Rel Crowell vs. Lawrence), the tunnel was thought by the Court to have been removed for the $130,000, with E.B. Litchfield's shill company the Brooklyn Central & Jamaica Railroad becoming the Assignees of the assessment money and contractor for its removal. Note the Brooklyn Central & Jamaica RR then assigned all the assessment monies to E. B. Litchfield personally, with E. B. Litchfield's brother E. Darwin Litchfield becoming the tunnel closing Assessment Collector (as per Litchfield vs. Vernon). (See pg 190 lines 6 and 7 here). According to the Court records (People Ex Rel Crowell vs. Lawrence), the tunnel was assumed by the Court to have been "filled up"- that's the actual term they used. On the face of it, the basis of the sum they came up with, $130,000 made perfect sense, as it cost the LIRR $66,000 to build it, so it followed that it would cost about as much to "fill it up". The other half of the assessment was damages for the loss of the right to use steam. As anyone who has been on the tunnel tour can tell you, it never was all "filled up" (See pg 142 here). The primary way in which E. B. Litchfield enticed the LIRR to assign him their rights to the tunnel and steam power "removal" assessment money, was he cobbled together for them their new East River access route from Jamaica to Hunters Point- track he newly built from Jamaica to Winfield Jct (NY & Jamaica RR), thence along the preexisting Flushing RR to Long Island City- which E. B. Litchfield already controlled. (See pgs 254, 265, 240 and 241- 242 here. Also this Brooklyn Daily Eagle article, of May 10, 1861 pg 2 fully explained the LIRR's new East River access route from Hunter's Point to Jamaica. A contemporary of E. B. Litchfield's described him as "Flagrantly and Monumentally Impudent". This was an understatement. After bilking residents out of $130,000 under the pretense of removing steam power and closing the tunnel, Litchfield turned around only two years later (1863) and attempted to partially repeal his "Tunnel Act" of 1859, thereby restoring steam locomotives to Atlantic Avenue. This bill was actually passed by the State Legislature, but then "Copperhead" Governor of New York, Horatio Seymour, ally of "Copperhead" spokesman Rep. Clement Vallandigham of Ohio and New York City's (Manhattan) Secessionist Mayor, Fernando Wood of the notorious Mozart Hall, failed to sign it into law. It's noteworthy that Gov. Seymour also vetoed a similar steam traction bill for Manhattan's Broadway- upon the advice of Brooklyn affiliated politician and ill starred Presidential candidate Samuel J. Tilden (See Source). In 1863, Atlantic Avenue residents finally grasped the scope of what E.B. Litchfield had perpetrated, and began referring to the entire affair as a "Corrupt Swindle". (See Source) In 1885, the Brooklyn Daily Eagle published the following article, in which "Deacon" William Richardson of the Atlantic Avenue Railroad Co. fully exposed the chicanery of the Litchfields in the Tunnel Act of 1859 and the hijacking of the Assessment money. Note- apparently, Richardson didn't realize that it was E. B. Litchfield aka "Pro Bono Publico" that initially instigated the Brooklyn political problems of the LIRR in the first place. (See Source). As for the operational fraudulence of the New York State "Tunnel Act" of 1859 itself, note that in order for it to become operative, a Petition of a Majority of Property Owners within the special assessment district created therein, was required to have been made to the Brooklyn Common Council, which would then trigger the tunnel closure and assessment process- as it turns out, there never was any such petition of property owners. Notice in the following Brooklyn Daily Eagle article, that in 1860 Mayor Powell complained that a resolution was brought forth in the State Legislature to require the City of Brooklyn to pay the tunnel assessment. Faced with this mutiny among the local property owners who were not forthcoming with the required triggering petition to the Common Council, Mayor Powell himself, in typical 19th century corrupt political machine boss style, fraudulently verified the required though non existent land owner's petition via the Common Council to the NYS Supreme Court, thereby falsely triggering the tunnel closure and assessment process. See pg 183 paragraph 2 and pg 184 of the original circa 1862 trial of Litchfield vs. Vernon here and the following Brooklyn Daily Eagle article here and Litchfield vs. Vernon, as cited below. In my opinion, the best summary of the relevant parts of Litchfield vs. Vernon can be found here (see pgs 201- 202). We know Electus B. Litchfield and his brothers used the special assessment tax district created for the contrived closure of the Atlantic Avenue tunnel as a financial vehicle to raise money for a real estate project, while Brooklynites were promised the "Atlantic Avenue Drive And Promenade" which never happened. The legend about E. B. Litchfield losing the money buying Confederate War Bonds was in reality a red herring. Part III : Where did all the money the Litchfields stole from Brooklyn go? Answer: To an attempt to take over the lands and railroads of the northwestern United States via federal railroad land grants and other financial tools, and then mortgage this wilderness property to unwary European investors at vastly inflated sums. 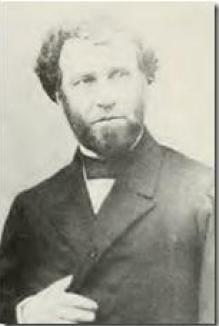 No doubt E. B. Litchfield used his brother E. Darwin Litchfield, then a London banker, to launder the money hijacked from Brooklyn to acquire all the stock of the St. Paul & Pacific Railroad First Division, their new land and railroad speculation entity in Minnesota, which already owned 307,200 acres (480 square miles) of federal land grants. The Brooklyn loot was likely used as seed money to construct more track in Minnesota, thereby leveraging more massive federal land grants, which in turn enabled E. B. Litchfield to issue more St. Paul & Pacific securities in Holland with these land grants used as collateral. It appears the Minnesota federal railroad land grants were extremely generous, the initial 307,200 acres were the reward for building only the first 10 miles of track. The total federal land grants accumulated by E. B. Litchfield in the construction of the St Paul & Pacific Railroad First Division would have been much greater, as the land grant for this railroad was increased to 10 sections (10 square miles) of federal land granted for every mile of track built, and the aggregate amount of land grant authorized for this railroad was 5 million acres. This land was unsettled wilderness, but the Dutch investors didn't bother to look. E.B. Litchfield soon availed himself well of his experience gained in Brooklyn during his fraudulent closure of the Atlantic Avenue tunnel. Essentially, E. B. Litchfield mortgaged to Dutch bondholders for top dollar, the virtually worthless Minnesota wilderness. By late 1869, he had issued securities of the St. Paul & Pacific Railroad First Division to Dutch investors totaling $13 million, with Litchfield allegedly having embezzled some $8 million (a tremendous sum in the 1860's) by faking construction work. See notation for the year 1857, and also page 132 of Veenendaal. 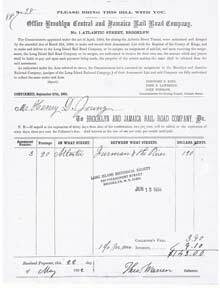 The Dutch investors only became aware of this massive railroad and land fraud in 1873, when they finally sent a representative to physically look at the land grants belonging to the St. Paul & Pacific. The Dutch investors had bought a huge "pig in the poke". (See Veenendaal pgs 130- 133, as well as the pages cited at this link to Albro Martin). As a genealogical aside, it should be noted that William B. Litchfield was the son of E. B. Litchfield. In turn, the noted New York City based 20th century architect Electus D. Litchfield was the son of W. B. Litchfield, or rather E. B. Litchfield's grandson. As a historical aside, where did Edwin C. Litchfield get the exorbitant sum of money required to build his antebellum "Villa" (which still stands inside Brooklyn's Prospect Park) ? Answer: Probably by selling and/or mortgaging Federal land he didn't really own in Iowa ("above Raccoon Fork" aka the "River Grant"), during the 1850's. See Source. The brothers had been legally "ejected" from their Iowa property in 1859 by the rightful owners, the Dubuque & Pacific RR. Note in the case cited above, the Litchfields were the plaintiff. ©2002-2011 Brooklyn Historic Railway Association, Brooklyn, NY.